In stock -This product will ship today if ordered within the next 4 hours and 24 minutes. 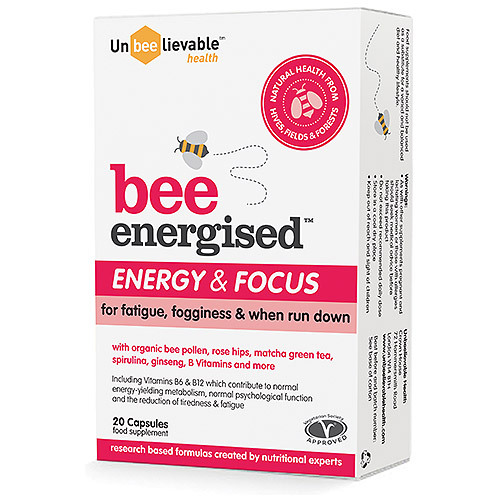 Bee Energised combines the highest quality organic and natural nutrients which have a proven history of benefits when it comes to helping improve energy levels and focus. This unique blend contains vitamin and mineral rich ingredients not usually found in a regular diet such as organic bee pollen, rose hips, matcha green tea, spirulina, ginseng, B vitamins and more, making it an ideal compliment to any health regime. Including Vitamins B6 & B12 which contribute to normal energy-yielding metabolism, normal psychological function and the reduction of tiredness and fatugue. Organic Bee Pollen, Rose Hips Extract, Capsule Shell (Emulsifier: Hydroxypropyl Methyl Cellulose), Organic Spirulina, Organic Green Tea Leaf, Organic Matcha Green Tea, Siberian Ginseng Extract, Vitamin B6 (Pyrodxine HCL), Vitamin B12 (Methylcobalamin). Adults: Take 1 to 2 capsules once or twice a day or as directed by a healthcare practitioner. As with other supplement, pregnant and lactating women or those with allergies should seek medical advice before taking this product. 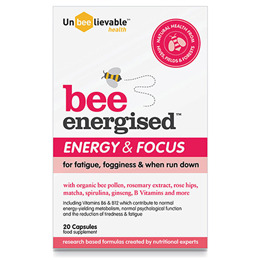 Below are reviews of UnBEElievable Bee Energised - Energy & Focus - 20 Capsules by bodykind customers. If you have tried this product we'd love to hear what you think so please leave a review.